Flip Flop only outputting A? Hey guys I've got a flip/flop for alternating between setting a variable of mine, but despite everything I try, it only outputs A and never B. I set it up according to the documentation, so I'm at a loss atm. Oh and in case it matters, I'm using it in the Gamemode blueprint. I've also tried using a branch with the Is A true/false, but still no dice. 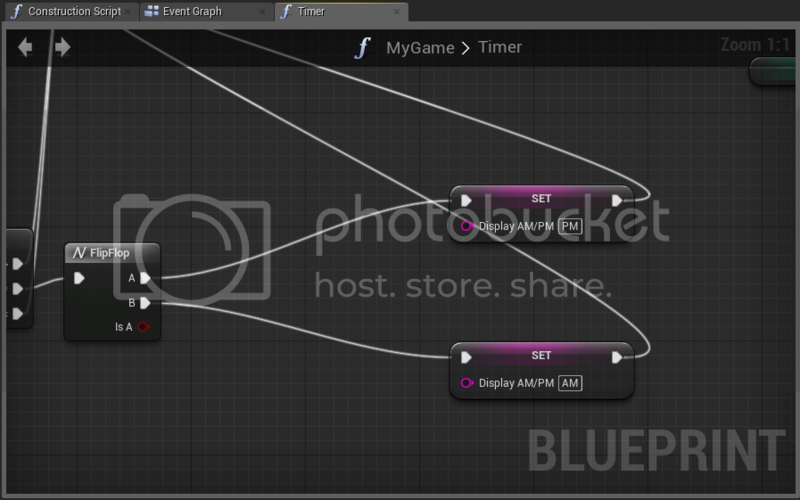 The FlipFlop node should switch from A to B each time it is used, but if this is inside a function that is called different times it might be resetting each time the function is called. Would you mind expanding the image you showed us so we can see how the FlipFlop is being used? Any additional information could help us reproduce the issue so we can help you figure out what's going on. Thanks! Yeah this is within a function. It resetting actually makes sense since it only seems to call A. I didn't realize it worked differently there. Is there some way I can get it to work still or should I go about this in a different way? Functions only fire the one time they are called, and then reset, so that's probably the problem. I would use a Branch instead of a FlipFlop and pass it a Bool variable, which you can set outside the function each time it is processed and pass it to the function when it is called. Hey thanks for the info, I'll try that and see how it goes. Btw The category setting for functions doesn't seem to do anything atm. Is that a bug? Can I offer a suggestion then? Can you make it so that the category you set it to groups it on the left similarly to how it groups the variables together? But yeah thanks for the info though. I can enter a feature request for that. Seems useful. Thanks! Thanks for the reply, hope it helps/makes it in. Looks like this has already been updated internally, and should appear in the 4.4 update. Function Categories will work exactly like variable categories. Is there any way to reset a FlipFlop?